The Rebel Sweetheart. 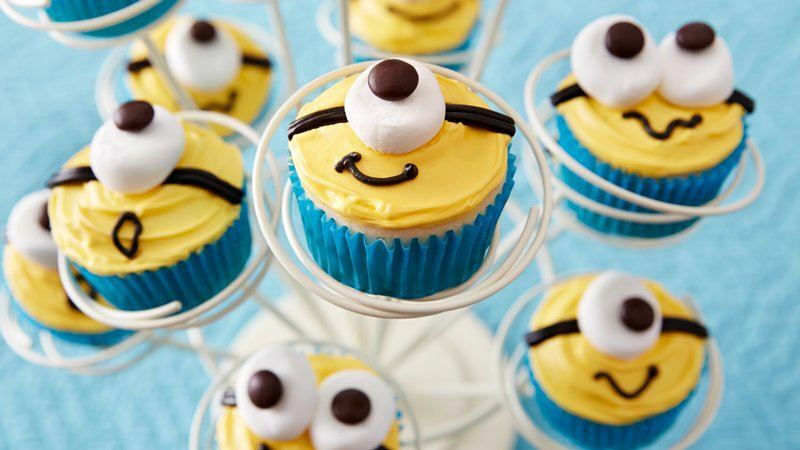 : Foodie Goodie | Minions Cupcakes. We're a little Minion-crazy right now (and by 'we' I mean my little man and I, and his friends from school and their moms, too), all the more after watching the prequel to the 'Despicable Me' franchise. We just got home from the cinema and my son is still reeling from all that yellow cuteness. Haha! And because we can't get enough of these banana-loving creatures, here's a recipe to celebrate the Minions' very own full-length movie! 1. Heat oven to 350°F. Make and bake cake mix as directed on box for 24 cupcakes. 2. Cool cupcakes completely on cooling rack, about 15 minutes. 3. Reserve 2 tablespoons frosting. Place remaining frosting in medium bowl; tint with yellow food color. Frost cupcakes with yellow frosting. 4. Use kitchen scissors to cut 1/4-inch circles off both ends of 16 marshmallows to make 32 total rounds. 5. Use reserved frosting to stick milk chocolate candies to marshmallows. Place marshmallow eyes on cupcakes, placing two eyes on some cupcakes and one eye on others. 6. Use black decorating gel to draw the the bands on each side of the eye, and to pipe a mouth on to each cupcake. As seen on Betty Crocker. The minions are so cute and this application on the cupcake is just perfect! These are great! I want my kids to make like 20 of these for me! Oh my God, these are too cute! My girls are all about minions. They'll love this, for sure. Oh gosh! They are so cute! I love how they look! Very lovely! Minion Love! These are so adorable and I would totally be making these for the kids. I love the Minions and think they are so cute. Thanks so much for sharing. Those cupcakes are adorable! I love the Minions!